I did this walk on Saturday 17th March 2007. I drove up to Therfield where I parked opposite the Fox and Duck pub which is on the route of the Hertfordshire Way itself. The day started quite cloudy with a strong wind which was a bit a shame as most of the preceding week had been bright and sunny with clear blue skies. One advantage of the spell of good weather though is that the paths are now much drier and no longer covered in sticky wet mud and as can be seen from the photos the weather gradually brightened up as the day went by and it ended up quite warm and sunny. From Therfield, photo 1, I walked back down past Therfield Church, photo 2, and took a footpath that ran between fields to join up with where I had finished my last walk along the Hertfordshire Way. This footpath continues along to a road which on turning left leads down to the village of Kelshall. The Hertfordshire Way follows the road through Kelshall passing the little village green with its new stone obelisk which features a number of small information panels as well as the remains of an old cross, photo 3. The route continues ahead before taking a grassy footpath that heads off to the right beside an old red brick wall towards the church of St Faith. The path then makes it way round the church, photo 4, and takes a gate into a field opposite. The Hertfordshire Way then heads across a number of fields before turning right along a hedge lined track, photo 5, as it makes it rather circuitous way towards the village of Sandon. Not long after joining this lane the route of the Hertfordshire Way takes a path off to the left however I continued on past this junction down to a road where I turned right, still thinking I was on the right route. It was only a little way further down the road when I finally stopped to check the route on the map that I realised I had gone off course and had to turn round to retrace my steps back. The place I should have turned was where I stopped to take the photo of the daffodils besides the path. The little detour added about .6 of a mile to my walk. Back on the right route, the path continues besides fields towards Notley Green. Passing besides Philpott's Wood, photo 6, the path links up with the route of the Hertfordshire Chain Walk, which I had walked last year, one of a number of occasions the two walks meet up in this area. The route also shares its course with the route of Icknield Way in a number of places. After continuing down the lane for some distance the route turns right onto the road towards Sandon. Just before I reached the road I passed a field containing some llamas, photo 7. This road is only followed for a very short distance, bearing to the right at a road junction, photo 8, before the Hertfordshire Way heads off to the right up what is signed as public byway 44, a tree lined route, photo 9, that heads between fields to County Road. Reaching County Road the Hertfordshire Way turns left for a short distance before taking a narrower tree lined footpath that heads to All Saints church in the village of Sandon, photo 10. Leaving the churchyard the path turns left onto the road which is then followed round to the right in the direction of Wallington down the Rushden Road. Passing the village pond I was hissed at by a goose which was standing outside the phone box. It also repeated this when I returned on my way back a few hours later! Towards the end of the village the Hertfordshire Way leaves the road and takes a footpath on the right that heads diagonally across a field. The route then continues along through a couple of kissing gates into another field that had been heavily churned up by horses, photo 11, the only really muddy stretch of walking I encountered all day: I was glad I had not had to cross over it earlier in the year. Crossing a drive the route then heads past a number of small paddocks as it makes its way towards the road at Roe Green, photo 12. At Roe Green the path heads straight across the road onto a track and then bears slightly right to take a grassy footpath that heads down into a field besides Rose Cottage. Leaving that field the footpath heads to the right along the edge of another very large field, photo 13, as it makes its way towards the village of Wallington. In the distance in the fields I saw a very large herd of deer and they stood for a long while watching me as I made my way along the field edge, undecided whether to run off or not. Within the herd there were two deer that were almost completely white, photo 14. Looking through the hedge from the field towards the North there were a few wide ranging views over the countryside towards Cambridgeshire. Eventually the path leaves the field and heads down a wide track besides a house to cross a road at the village of Redhill and the route crosses from the Ordnance Survey Explorer map 194 to map 193. The Hertfordshire Way continues directly over the road and heads over a couple of fields, photo 15, to reach the village of Wallington. Although there has only been a week or so of drier weather the paths across the fields here were already dry and cracked. The route then follows a loop through Wallington, photo 16, heading to right down the road through the village, turning left at a road junction and then heading up steps to a footpath on the left. This heads back, initially behind gardens, towards the village church, photo 17, quite close to where the Hertfordshire Way had originally reached the road. The route I followed is the one as described in the second edition of the Hertfordshire Way guidebook and is a little different to that which is marked on my Ordnance Survey Explorer map which is not the latest version. Leaving the churchyard at Wallington the route turns right besides a small pond. The path follows the tarmac track around to the left to join a muddy lane. The Hertfordshire Way leaves this lane on a footpath that runs off to the right besides the edge of another very large field. The landscape here was a little less open than the previous few stages of the Hertfordshire Way with more trees lining the fields and scattered patches of woodland. Leaving the field the route takes a small wooden bridge into one of these patches of woodland at Bush Spring. The route through the wood liberally marked with footpath signs, four of which are visible in the full size version of photo 18 alone; so no chance of getting lost here. Leaving the woodland the path heads along a track that runs besides Clothallbury Wood, over a field and down a track to the A 507 road that runs to Baldock. Crossing the road the Hertfordshire Way takes a path that bears to the right over a field towards the village of Clothall. The field had recently been ploughed and the precise route was unclear although after having turned to the right and continued ahead for a short distance I turned slightly to the left heading along the line of the phone wires that run over the fields leads in the correct direction towards the village of Clothall. From the field there were views over to Baldock which could be seen in the distance, its church spire glinting in the occasional patches of sunlight that had started to break through the clouds. Reaching a road the route turns left and goes past the village hall. Leaving the village of Clothall the Hertfordshire Way takes a footpath off to the right by a bend in the road to take a track that runs down besides a field, parallel with the A 507. As it heads downhill there are quite extensive views off to the right over the chalky fields. Reaching a field, photo 19, the footpath follows a path that runs a few yards down from the left hand edge of the field as it makes it way across the field towards a hedge which can be seen ahead. Reaching the hedge the route then joins a broader track, photo 20, that runs gently downhill towards the farm buildings of Welbury Farm. Reaching the farm the Hertfordshire Way turns to left past some outbuildings to start heading gently uphill as it starts making its way towards Weston. It was a very attractive section of walk heading uphill along the field edge towards a patch of woodland, photo 21, on the horizon. Leaving the field the route turns to the left and then heads uphill along a track besides the edges of the woodland. Passing a patch of woodland, Green Grove, the Hertfordshire Way follows a farm track, photo 22, round to the right to reach the road at Green End, where the path heads across the road. Crossing the road the path runs to the left of the last house from where it heads down across open fields. To the right were views of the water tower in the village of Weston. Crossing over a stile into another field I followed the field edge along to another stile where I finished my walk along the Hertfordshire Way for the day, photo 23. At this point I had walked 9.94 miles, all along the Hertfordshire Way, although about .6 of a mile of this was when I had gone in the wrong direction near Sandon. I headed to the left over the stile as I started walking back to the car. The sun really started to break through the clouds and the wind was now behind my back which made the walking a bit more pleasant. I stopped for a lunch break by another stile as I made my way due East over fields, photo 24, back to rejoin the route of the Hertfordshire Way where it had crossed over the A507. In a small hamlet before the road there was a cage in a garden with some big muzzled dogs in it which started barking as I walked past and I could still hear them barking away like mad even when I had crossed the next field and reached the road. I felt sorry for the people who had to live near them. I then followed the Hertfordshire Way back the way I had come until near Wallington I left the route, turning right onto the lane, then left, down a track besides some woodland. To the right a buzzard was flying around, it was its mewing calls that once again alerted me to its presence. There were plenty of Spring flowers in the bloom and crossing the road close to the small hamlet of Redhill I spotted several clumps of white violets, photo 25. 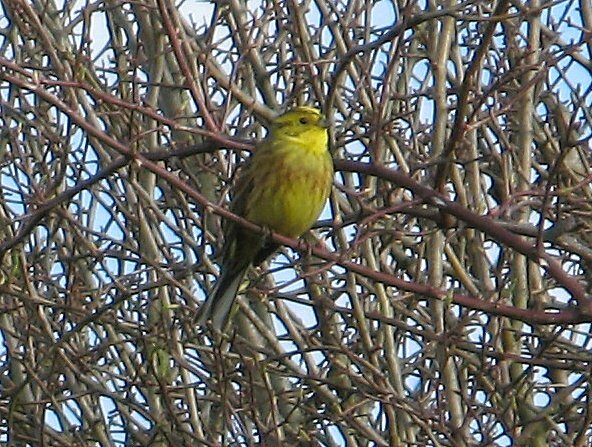 I also spotted a flock of yellowhammers in a hedge, one of which kindly remained still for a photo, 26, slightly out of focus but much better than I could have taken with my old camera. After crossing a couple fields I took a footpath off to the left that runs alongside the River Beane, photo 27, very close to what must be its source as I was on some of the highest ground in the area. Reaching a road I took another footpath than ran off over fields to the right, once again following a ditch running alongside a field. In several places there were clumps of primroses in flower on the banks, photo 28. On the way I passed by a small bridge, photo 29, that I had walked over and also photographed some 11 months earlier when I had been walking the Hertfordshire Chain Walk. A little further on I took a path that led over fields, photo 30, to the road that runs between Roe Green and Sandon. Here I turned to the right and took another set of footpaths that runs behind the village of Sandon before making my way up to the road close to the church I had passes earlier in the day, photo 31. From Sandon, I followed the route of the Hertfordshire Chain Walk as I made my way back through Kelshall and on to Therfield. 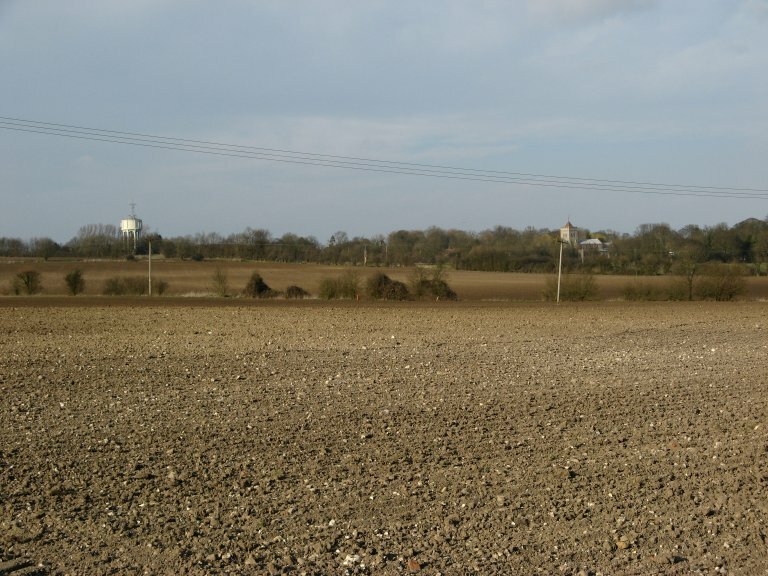 The final two fields, photo 32, had recently been ploughed and the path not yet reinstated however the soil was dry and quite easy to walk over. When I had ended my last walk in Therfield I had followed the old route of the path so on my return I walked up to the water tower where I turned right over a stile to walk the revised route of the Hertfordshire way through the village back to the car. The total distance I walked for the day was 17.5 miles of which just under 10 miles were along the Hertfordshire Way. This was another pleasant walk through the North Hertfordshire farmland. The scenery was reasonably varied with plenty to see. The footpaths were well signed and I have now moved towards an area I have not walked in before, having left the route of the Hertfordshire Chain Walk. However the most notable thing about today was how much energy I had. Even after 17.5 miles I felt considerably better than I had after some of the 12 mile walks earlier in the year and could have happily continued walking.